I picked up an inexpensive slow cooker awhile ago, and I have been enjoying it quite a bit. I never would have had much use for it before, but it pairs well with the freezer I bought last summer. I love being able to fill it up in the morning, have a hot meal ready at night, and then freeze the leftovers. I made chili yesterday, and it got me thinking about something that has less to do with cooking and more to do with freethought. Aside from being so spicy I could hardly eat it (I added far more hot peppers than I should have), my chili turned out okay. Still, it was missing something. I am not nearly experienced enough in the kitchen to be able to taste something and immediately know what is missing. In this case, I just know something was missing. The final product was close but not quite there. One of the things that has always fascinated me about cooking is how the whole really is greater than the sum of the parts when it comes to ingredients. 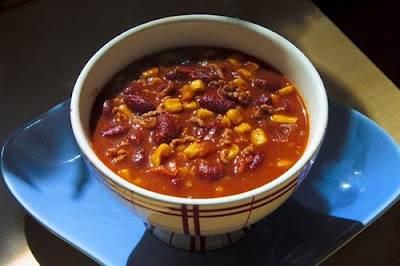 It is not just that omitting an important ingredient completely changes the character of the dish but that the precise combination of ingredients can make the difference between something adequate (my chili) and something exceptional. But what does this have to do with freethought? We do not always know - at least I do not always know - what will emerge from a collection of ingredients. When I look at a new recipe, I often think I can tell whether it is something that might work or that I might like; however, I'm sometimes very wrong about either or both. It is not until I give it a try that I am in any place to know with any kind of certainty. I think the same is true of ideas (and perhaps even the people who hold them). One of the reasons it is so important to me to expose myself to new ideas, including those to which I am predisposed to react negatively, is that I am often wrong. Through an open-minded exposure to new ideas, I can sometimes identify and correct errors I would have otherwise missed. And just like trying a new recipe can be a pleasant surprise that opens up new possibilities (e.g., I used to think I hated spinach but have developed a taste for it), engaging new ideas can have similar effects. There have been countless times in the last year alone where I have caught myself pre-judging an idea about which I had insufficient exposure because of what I had heard about it from others. More often than not, I learned something as a result of examining the idea for myself and listening to its proponents. In some ways, the person who encases himself or herself in a bubble or "safe space" and refuses to engage any viewpoints which do not fit his or her preferred socio-political narrative is like the person who eats exactly the same meal every night. Perhaps some select few are able to make that work for them, but I am not one. I need variety and spice in my food; I need variety and challenge in my ideas. And so, I will continue to seek out and engage thought-provoking ideas, especially those against which I am warned. And I will continue to suggest that this is an essential part of what it means to be a freethinker.